Biology Professor Eric Wetzel’s work in global health has led to a formal agreement between Wabash College and Universidad Nacional Hermilio Valdizan (UNHEVAL), Huanuco, Peru, on future research and health projects. 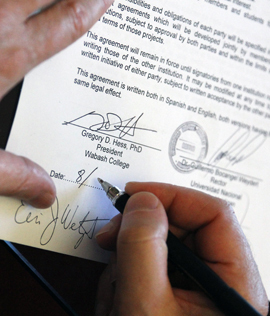 The formal agreement signed by Wabash College President Gregory Hess and UNHEVAL Rector Dr. Guillermo A. Boncangel Weydert, establishes a formal relationship for future research, immersion learning possibilities, and student/faculty exchanges. Nationally, Peru healthcare initiatives have been underfunded resulting in myriad health problems in the country’s poorest regions. Malaria and yellow fever remain significant diseases in the South American country, according to the U.S. Center for Disease Control and Prevention. The safety of water and sanitary services is spotty throughout many regions. 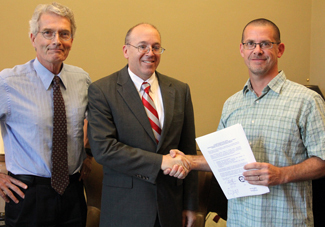 The agreement, Wetzel argues, might be a bigger advancement for UNHEVAL than Wabash. “Sometimes you think you have to jump through hoops in this country," Wetzel explained. "Well in other places you may have to jump through 10 times as many hoops. Now we have an agreement and if we need vans, lab space, or whatever this will make everything smoother when we work there. It will also make it easier for them doing research on collaborative projects. 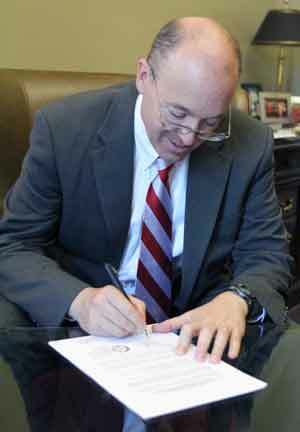 President Hess signed the initiative August 14. UNHEVAL’s President/Rector signed days earlier. “All of us at Wabash are proud of the work Professor Wetzel has done to establish our global health program in Peru,” President Hess said. “Our mission calls us to educate young men to think critically, act responsibly, lead effectively, and live humanely. Our program in Peru emphasizes all four of those elements. Wetzel said the program establishes agreed upon fields of exchange and cooperation. He can see two-way invitations for lectures, conferences, and seminars. Ideally, he said, it would be “awesome for [Peruvian] students or faculty members to visit Wabash and tie the visit into a global health or Latin America history course. The Dean also sees the agreement as another example of how Wabash College changes young men’s lives. The impact of such an agreement, he said, shows small communities far from Crawfordsville that a small, Midwestern liberal arts college for men meets the needs of the nation and the world. With a signed agreement, Wetzel turns to what’s next. “What has to follow is more specific projects, more specific agreements,” he said. “I have already expressed my desire to work in poor communities on the impact of various diseases (e.g. water-borne diseases) and the impact on children and women in those areas. Wetzel also noted the on-going assistance of Peruvian colleague Jorge Cardenas who does much of the planning for the Global Health Initiative work.